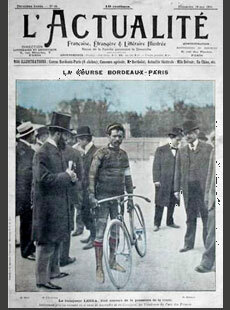 The origins of the Bordeaux to Paris cycle race are back in the 19th century. In England it was the prosperous late Victorian era and in France - La Belle Epoque. A golden age for the upper classes, as peace prevailed among the major European powers, new technologies improved lives that were unclouded by taxation - and artists adapted Renaissance and eighteenth-century styles to modern forms. The first race was held in 1891 and the field included a group from England invited by the organising newspaper Véloce Sport. The group included George Pilkington Mills who had already set the record for Lands End to John O’Groats in 1886 at the age of 18. Mills won covering the 600km in 26 hours and British riders took the first 4 places. Note 1 - The press reports from 1894 give Sanson (England) as 3rd - but Memoire du Cyclisme lists Lumsden in 3rd place [possibly because Sansom was ruled a professional by the NCU?]. This Sanson was, most likely, H. H. Sansom of Nottingham; the tandem partner of E. Oxborough (or Oxborrow?) 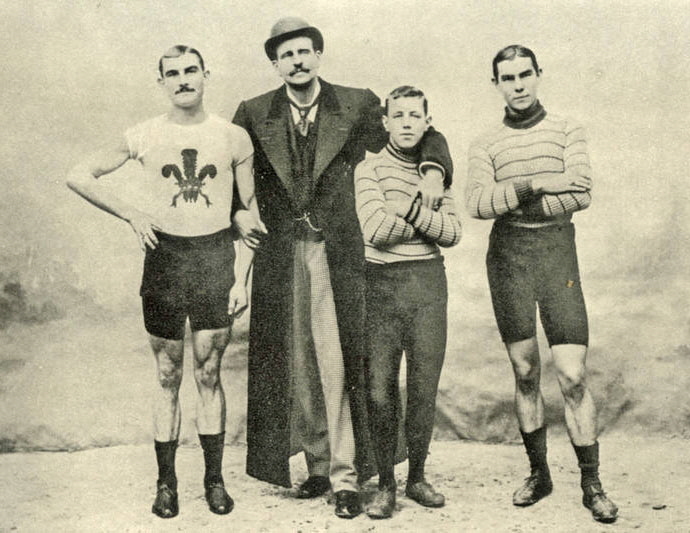 when setting the English 100 mile record in 1894. Based purely of birth records the Herbert Henry Sansom registered in Nottingham during the September Quarter of 1863 is the closest match. Note 2 - Some records give R H Carlisle as 3rd in 1895 (?) and J E L Bates as 4th in 1891. For many years his early death, and his sporting achievements, were attributed to the “medicines” commonly used in endurance races at the time. But recently Linton’s death has been reassessed - with a researcher finding that "He actually died of typhoid and it seemed the typhoid was brought on by over-exertion." So the stories from the time may have been wrong - but time is a one-way street with no way back. Arthur Linton is now honoured with a blue plaque on Navigation House in Abercynon. Arthur’s former trainer, James Edward “Choppy” Warburton, died in Wood Green, London the following year (Dec-1897) aged 53. But his success as a runner and trainer had not made him any money - he left only three half-pence (more). Below - Arthur Linton, Choppy Warburton, Jimmy Michael and Tom Linton. 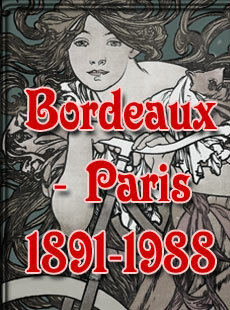 The brief period of British successes in Bordeaux-Paris was over. It was now the turn of France and Belgium to provide the headline makers - as seen here with front page coverage for 1901 winner Lucien Lesna. A pattern for pro road cycling that was to be repeated for decades to come. Between the world wars only one Swiss victory (by Suter in 1925) broke the Franco-Belgian dominance. But then Wim Van Est won for Holland in 1950 followed by a 2nd in 1951, 1st in 1952, 2nd in 1953 and 1954. He finally won again in 1961 and the reputation of Bordeaux-Paris was at a high. In Britain the sporting press had dropped cycling from their coverage in the early years of the sport - mainly because there was little of interest to report. 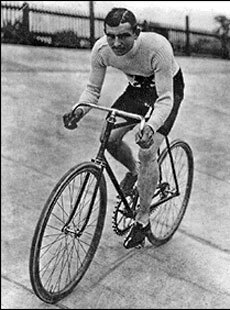 The sport’s governing body the Bicycle Union, later the National Cyclists Union (NCU), did not allow professionals nor massed-start road racing. 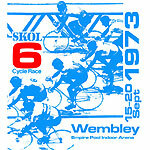 Road cycling time trials were allowed but bound-up in rules about no publicity, coded routes and disguised racing kit. It is probably no exageration to say that from 1896 onwards there was no coverage of Bordeaux-Paris in the British mass-media. Brian Robinson’s 5th place in 1958 after a 9th place back in 1957 was largely ignored. 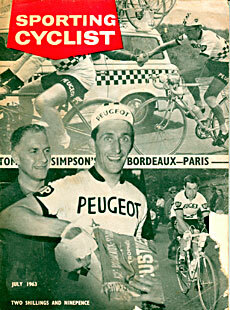 But that changed one day in 1963 - when Tom Simpson won in Paris. The full report by JB Wadley takes you back to the enthusiasm of the day. Tom tried again in 1965 but was beaten by a man on a mission; Jacques Anquetil. 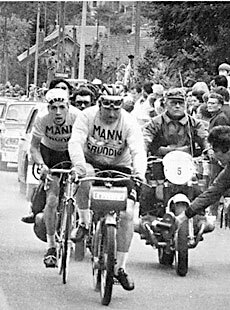 In fact he was beaten by a tandem as Anquetil and team-mate Jean Stablinski attacked in turn to ensure that Jacques could “prove” that he was better than his great rival Raymond Poulidor (more). Simpson was 3rd at just 57 sec with Vin Denson back in 6th at 18mins. Barry Hoban was also 6th in 1970 and Paul Sherwen 10th in 1982 but that was not enough to put Bordeaux-Paris back on the British sporting radar. In the early days the pacers were bicycles, tandems, triplets and even quadruplets. But in 1931 motor bikes took over and this pacing became more specialised in 1938 when the Derny was introduced. The race slowly faded away with 1985 being the last year of pacers and 1988 was the last pro race. The spirit of the race reappears at times in rides for the cyclo-tourist, randonneur and cyclo-sportive categories - with 2010 being the most recent one organised. Will the Derny-paced pro race ever re-appear? It looks very doubtful - but then never say never.